Every seen the film 'Sliding Doors'? 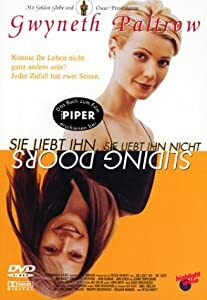 Released in 1998, starring Gwyneth Paltrow and John Hannah follows the life of one woman and how different her life could be after one inconsequential moment - whether she manages to make the train or whether she misses it. That moment changes everything that her life is, was, and ever will be. Now I'm a firm believer of fate and chance. The people we meet, the experiences we have are all what we are destined to have - are all our set path... and nothing we can do, will mean that we can change the outcome. Being this firm believer in fate, when I met my BF and we 'clicked', I figured that our paths had crossed for a reason and that we could get over the - up to 90 miles apart (Clichéd, I know - but long distance can work! We both think it must be fate that he's following in his fathers footsteps by even entertaining the thought of dating a girl from several counties away. I'd like to think that my chosen path will mean that I leave a mark on the world and actually have achieved something that means I'm remembered... Who knows?